But fear not; here’s a comprehensive best-of-the-best report from our native-born “mole” about what went down last week menswear-wise in the USA…. • Raleigh Denim Workshop: The beloved brand from North Carolina had a hugely successful and busy show and it was easy to see why. Its new Made in the USA shore coats, sportcoats and old-school plain cotton sweatshirts are perfect complements to its assortment of bottoms, which range from colored chinos to a tonal jean in a gorgeous shade of blue. 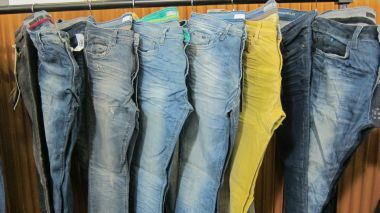 • Slate: A new jeans brand from Dallas, Texas, it offers classic-look men’s jeans that retail for about $210. • EFM: The sweater blazers (retail $425) from Engineered For Motion by Donrad Duncan up the athleisure trend by dressing it up a bit. • The Cords and Co: This brand new Swedish brand from the creators of Happy Socks aims to spearhead the revival of corduroy (“a fabric that has been forgotten” according to export sales manager Oskar Odling) as a welcome alternative to denim. And its range of bottoms in a variety of colors and wale widths did indeed stand out amongst its fellow exhibitors. • Jean Shop: Eric Goldstein’s line is still rich with heritage looks but two particularly outstanding items for the season were a raw denim chino with a Hollywood waistbrand and a pullover collared denim shirt. • Rowdy Gentleman: The Canadian T-shirt, sweatshirt and accessories brand showed a fun collection that paid tribute (probably with tongue in cheek) to the rousing retro American patriotism of the Reagan era. 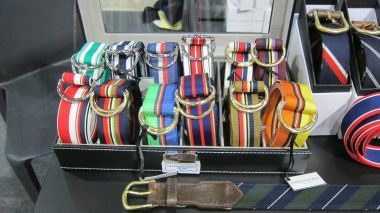 • FH Wadsworth: A new accessories brand from NYC, its ribbon and printed belts may look preppy but they are cool enough to be carried by such fashion-forward boutiques such as Noah NYC. With a highly diverse mix of brands that spanned everything from sports to suiting it was hard to nail down a single significant trend at this season’s edition of Liberty. Other than the fact that its exhibitors were all, as always, high-quality. Sam Ben-Avraham and his team pulled off another wonderfully curated and organized event. The prevalent heritage and/or distressed denim theme was seen at jeans brands KRM (from Japan,) Cult of Individuality, Laboratorie/86A and two British imports, Alive and Other, both of which showed in Rogue Network’s multibrand booth along with fledgling goth T-shirt brand Death Valley Co. Meanwhile, there was a post-apocalyptic theme from LA-based brand C2H4 with distressed hoodies and cobbled together vintage-look patchwork and subtle militaristic details (hidden pockets and an traditional Asian silk lining on a reversible bomber to show “hidden support for the enemy if need be”) in the fantastic “New American Revolution” fall 2017 collection from Descendant of Thieves, which took a somewhat dark – yet very successful – turn for the season. Sportiness and oversized zippers were on view at Italian backpack brand Supe and Gola is preparing to mark the 40th anniversary of its iconic Harrier model next year. And speaking of heritage, Schott Perfecto showed a limited edition biker jacket made with rugged Horween leather, the longtime American tannery founded in 1905. The piece is so sturdy that it literally can stand up sculpture-like without a hanger... Cool (and LOL)! • Dickies Construct: The higher end version of the famous workwear brand will return to stores in March and streetwear fans will undoubtedly welcome its contemporary takes on rugged styles, including a camo-print jacket that features Patone colors trademarked by the mother label. Its new line of wristwatches (retailing at $68 to $110) is also bound to be a hit. • Matiere: This LA-based brand known for its unique fabrics has a 1970s punk-inspired theme for fall 2017 – an apt one for our current angry, tumultuous times. 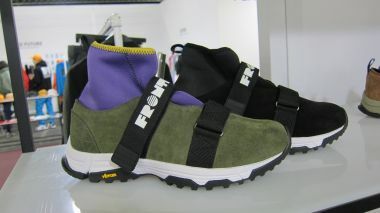 • Fronteer: This young footwear brand is out to inject some fashion into the standard hiking boot and add some style to the tired standard outdoor look. Its forthcoming collaboration with Manastash will only help it achieve this goal. • Faro Clothing: Making its debut at Capsule, this pricey denim brand (jeans will retail for $500) by self-taught designer Ruben Alfaro is definitely one to watch. Its raw-edge denim side panels and printed jeans emblazoned with “Coronation” (in honor of its arrival and a nod to “Game of Thrones) drew a lot of attention from visitors. • Naked & Famous: On the cusp of its 10-year anniversary next year, Brandon Svarc’s always inventive denim label continues to awe and amuse. Its fascinating fall 2017 offerings include wine-dyed jeans, selvage edges emblazoned with curse words and a one-of-a-kind “dobby diamond” denim fabric. 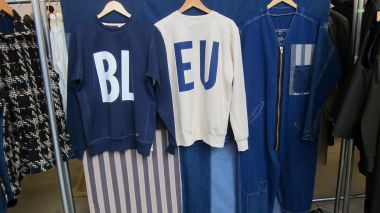 • Country of Origin: A London-based knitwear label, that is big in Japan, CoO made its US debut at Capsule with a gorgeous assortment of sturdy jumpers, many of which were colorblocked in eye-catching bright hues. • Bristol: Just in its second season, this LA-based brand uses basketball as its inspiration but elevates on-court looks with stylish, dressier garments that employ Japanese fabrics. MAN moved to a new home this season, Spring Studios below Canal Street, and the natural light that poured into the roomy, airy space only help better showcase the especially fine collections it showed once again. Chock full of terrific brands from Europe, Japan and other parts of the world, the show was catnip for better stores seeking an exceptional assortment. • D/Nero: This Japanese denim brand wowed with a tuxedo-inspired collection, complete with a cummerbund-inspired waistband an jeans that mimic the vertical satin ribbon on formalwear pants. • Litoral: Portuguese designer Pedro Monteiro uses a land-meets-sea color palette of green, blue and tan on his clean collection that beautifully keeps menswear chic but simple. Shuttlenotes and Orslow: Proof positive that the Japanese probably do heritage denim looks better than the USA. • Maximum Henry: The young Brooklyn-based accessories and belt designer has upped his game with new pieces and a more colorful assortment. • House of Future: This new super-clean sneaker brand (along with bag label Mad Rabbit Kicking Tiger, or MRKT) happens to be 100% vegan. • Bleu de Panama: This French label got aboard the popular Asian theme for fall 2017 with Mandarin-collared shirts and other delights from the (supposedly) Far East. Hyper-distressed and crazily washed rocker-appropriate denim and retro sport looks were two of the big fashion themes at Agenda NY, the street- and skate-friendly expo, which returned to Pier 92 for a two-day run. The former trend was huge for brands such as Rustic Dime, Golden Denim, Embellish NYC and its more affordable sibling Crysp NYC, Damati Jeans and LA-based Rockstar, which also showed painted bombers and jeans with images plucked from comic books. 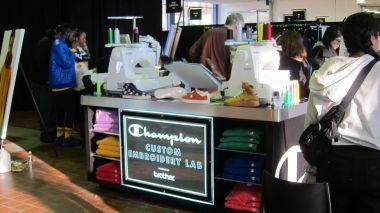 The retro sport trend, meanwhile, was apparent at newly relaunched soccer brand Umbro and at Champion. Interesting new items at Agenda included People footwear’s new high-tops that have a sock-like ankle and the just-launched line of raingear and parkas from Herschel Supply Co.
Also on hand was JME Selvage Denim of Hong Kong, a 53-year-old resource with its own factories in mainland China that offers more than 400 unique denim fabrics and finishes including a so-called “rainbow selvage” with multicolored yarns and abrasions and chino and chambray selvages.